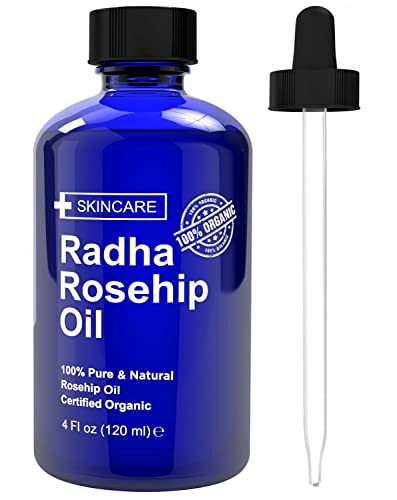 If you are looking for a natural treatment that can give you glowing skin and soothe any dryness or irritation, rosehip oil may be a great product for you to try. It has tons of benefits for the body, because it contains healthy fats that we need to repair damaged tissue. Rosehip oil is a great natural alternative to some of the harsher acne treatments on the market, such as salicylic acid or benzoyl peroxide, which can be too drying for people with sensitive skin. In this article, we’ll discuss the best rosehip oil products on the market and how to use them to get the best benefit for your skin. What exactly is rosehip oil?​What are the benefits of rosehip oil?How should I use rosehip oil? Rosehip oil is extracted from the seeds of a specific type of rose bush that is mainly found in Chile. It contains a variety of things that are great for the skin. In particular, it is very rich in fatty acids, such as omega-3, which can help keep the skin feeling supple and repair cells and tissues that have been damaged. Our body does not produce these fatty acids naturally, so using rosehip oil can provide you with great results that your body cannot replicate on its own. Additionally, rosehip oil is a natural source of vitamin A, which is known to produce a brighter, clearer complexion by increasing cell turnover. Finally, rosehip oil is a good source of antioxidants for your skin, which protect against cell damage. With such a great blend of ingredients, rosehip oil has tons of benefits for the skin and face. One of the biggest benefits is that it can fade scars from acne, burns, and any other type of damage, because it increases cell turnover, allowing the marks to fade gently. It also is a great anti-aging product, both for those who want to fade some of the effects of aging, and for young people who want to prevent the visible signs of aging from getting worse. The fatty acids in rosehip oil reduce the appearance of fine lines and wrinkles, while the antioxidants can help prevent sun spots and other related damage. How should I use rosehip oil? The instructions for how to use each rosehip oil product will be listed on the package, so be sure to read the instructions that come with it before applying to your face. Generally, you should apply rosehip oil to your face while it is dry and it should absorb naturally. Application twice a day works well for most people. Although rosehip oil works well for acne scars, it should not be applied onto any acne while it is still active. This product contains 100 percent rosehip oil. It’s completely natural and certified organic, with no added chemicals. The company is completely cruelty free and committed to supporting natural products, so you’ll know that you’re getting the best products for your face and body. It contains four ounces of rosehip oil, which should provide you with months of use, as you only need a few drops to make a difference to your skin. It comes in an appealing glass jar that looks nice on your countertop and is very easy to use - it has a simple dropper to help you place the product right on your skin. This product contains 100 percent pure, cold-pressed rosehip oil with no additives. It comes in a four ounce bottle, which will provide you with several months of use. The product is completely organic and uses cruelty-free production and testing. Both the bottle and the dropper are made of high quality glass and are simple to use. The company is committed to customer satisfaction and refunds any purchase if you aren’t satisfied with the results. It works effectively for scarring and skin damage, and many customers find that it works well for treating extremely dry skin as well because it increases cell turnover. This organic, cold-pressed product contains 100 percent rosehip oil from Chilean roses. It contains no additives or chemicals, and you only need a few drops to see results. The product is organic and made with cruelty free production. It comes in both a one ounce travel size or a full four ounce size, so you can choose how much you want to purchase when trying the product out. 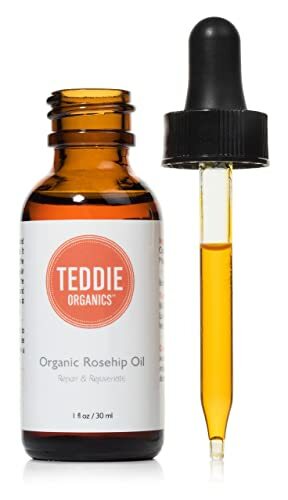 Teddie Organics provides a PDF upon purchase of all the ways you can use rosehip oil to benefit your body, which is very helpful for anyone that is new to using the product. They also provide you with coupons for future purchases and provide refunds for customers who are not satisfied. Customers have found that this product leaves their skin feeling very soft, reduces dryness, and fades any marks on the face. It does take about a month or so to see results, so you need to be very diligent when using it. However, if you are willing to put in the time, this is a great product to help you get rid of scarring and other skin issues. This product contains 100 percent rosehip oil that is completely organic with no additives. 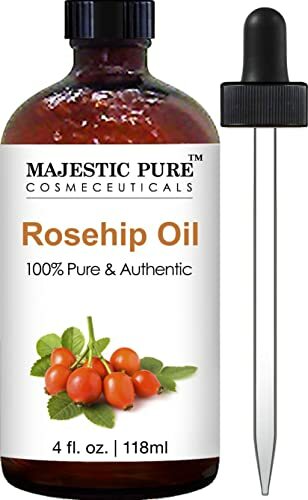 The difference between this oil and many other rosehip oils is that it is certified virgin and unrefined, so it has not gone through any extra production after being extracted from the roses. This means that you’ll get dramatic anti-aging and scar treatment results, and you’ll also find your skin feeling very hydrated more quickly than you might with a refined rosehip oil. It comes in a four ounce bottle, which can last for a very long time given that you need such a small concentration to see effective results. Like some other essential oil products, many customers find the smell a bit unusual, which is something that is very important to know before purchasing. With so many rosehip oil products on the market, it can be very difficult to determine which one is the best rosehip oil. We recommend any of the oils listed here to help treat skin problems such as scarring, dryness, and wrinkles. In particular, we like the InstaNatural Rosehip Seed Oil, because it is certified to be virgin and unrefined, providing a high concentration of product. If you’ve struggled with conventional moisturizers and other skincare products, then switching to rosehip oil might be the best solution for you. The natural, organic concentration of fatty acids, vitamins, and antioxidants can completely change your skin.